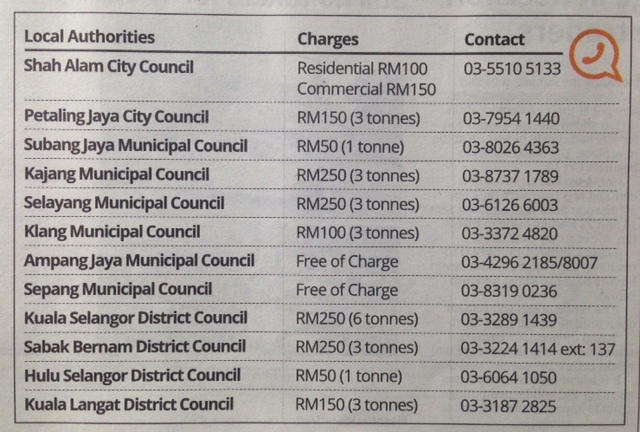 PETALING JAYA: Elected Members of Parliament can earn up to RM10,000 in monthly perks and allowances. According to Statute Paper No. 235 of the Members of Parliament (Remuneration) Act 1980, MPs are afforded monthly allowances such as for entertainment (RM1,500), personal driver (RM1,200), travel (RM1,500) and telephone (RM900). 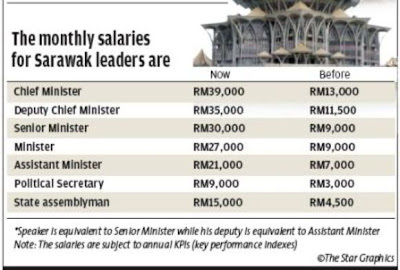 It said MPs are also paid an allowance of RM200 per day when they attend meetings in Parliament and RM150 when they attend any meeting, briefing, seminar or event organised by ministries or government agencies at the federal or state level that they are officially invited to. Besides that, MPs can also claim, while on official duty, food allowances (plus 25% for tips) and funds for hotel room and laundry charges, parking and toll fees, and money for them to buy warm clothing and ceremonial attire. Other perks MPs enjoy are free medical treatment for themselves, their spouse and children below 21 at government hospitals and clinics, computer, car and housing loans, free firearm and motor vehicle licences, as well as pension and gratuity for their services under certain terms and conditions. 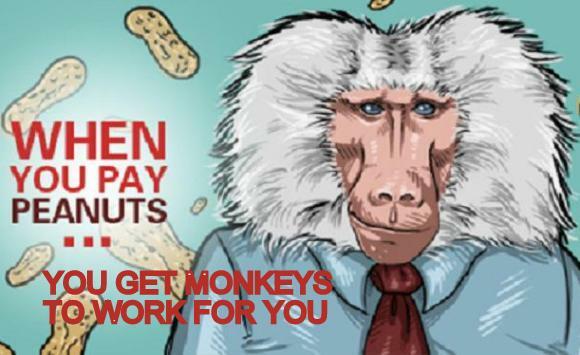 You know what they say - if you pay peanuts, you'll probably get monkeys working for you. Former Singapore PM Lee Kuan Yew was quoted making the remark in justifying the astronomically high salaries Singapore ministers earn. Singapore pays top dollar to attract the best brains to run the government. This also reduces the incidence of corruption. 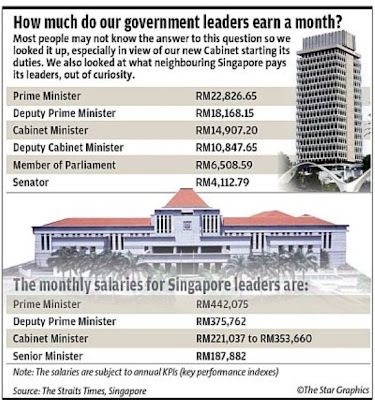 Prior to 31 December 2010, Singapore Prime Minister's annual salary was S$3,072,200, while the pay of ministerial-grade officers ranged between $1,583,900 and $2,368,500. A Committee to Review Ministerial Salaries appointed on 21 May 2011 recommended wage reductions, with the Prime Minister's salary being reduced by 36% (including the abolition of his pension) to $2.2 million (about US$1.7 million). Nonetheless, the Prime Minister remains among the highest-paid political leaders in the world. 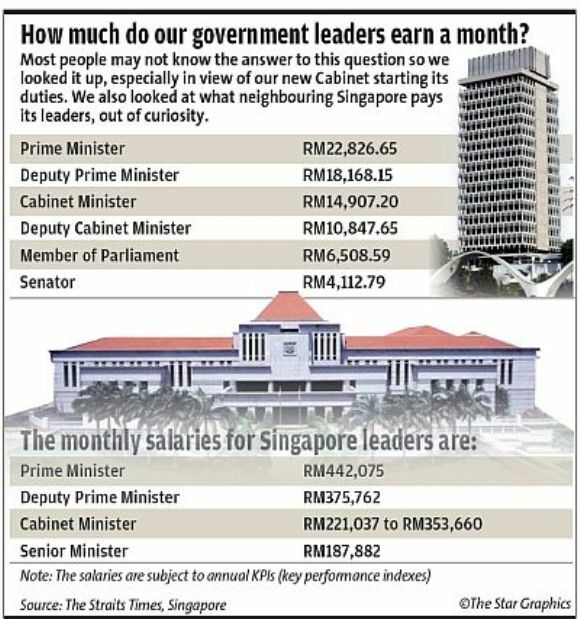 Do you think our Malaysian ministers deserve a pay rise? Or do you think their low salaries is commensurate with their (lack of) experience and qualifications? Postscript: The Sarawak state legislative assembly has just approved a 3-fold pay rise for ministers and assemblymen, to be backdated to January 1, 2012. The last salary adjustment was in 1992. Click here for the full article. Chief Minister of Sarawak Abdul Taib Mahmud will now draw a salary much higher than PM Najib's. It's a matter of time before we see a review of ministerial remuneration. 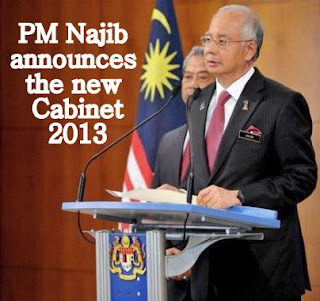 The reward for retaining control of the government after GE13 - a huge pay rise? A sure bet since the PM is also the Finance Minister! By the way, CM Taib is also Minister of Finance and Minister of Resource Planning and Environment. So much absolute power in the hands of one man! Now that the PM has announced his cabinet, what do the people think of his choice of ministers and deputy ministers? Perhaps before we answer the question, we should look at the criteria for evaluating a candidate running for political office. To help us out, let's look at Brett and Kate McKay's article "The Four Qualities of a True Statesman". It's based on Prof Rufus Fears' extensive research on statesmanship. Did the PM use these qualities as a yardstick in picking his cabinet? The statesman builds a platform on a foundation of firm, unchanging, fundamental truths that he believes at his very core comprises his overarching philosophy. In the face of changing times, opposition and challenges, this foundation will remain intact. A statesman may change the details of his policies and his methods, but only inasmuch as expedient tactics serve to further his bedrock principles in the long run. A statesman does not govern by public opinion polls, but instead makes decisions by following his own moral compass that is rooted in a sense of absolute right and absolute wrong. He is not a relativist. When he believes something is wrong, he plainly says it is so and does everything in his power to fight against it. When something is right, he is willing to overcome any opposition to preserve and spread it. The statesman is ambitious—he must be to obtain a position of power— but there are things he simply will and will not do to get to the top. He is a man of integrity; he speaks the truth. He leads by moral authority and represents all that is best in his countrymen. A statesman has a clear vision of what his country and his people can become. He knows where he wants to take them and what it will take to get there. Foresight is one of his most important qualities, because he must be able to recognize problems on the horizon and find solutions good for both the short term and long term. The statesman keeps in mind not only the here and now, but the world that future generations will inherit. A politician may have a bedrock of principles, a moral compass and vision, but if he lacks the ability to build a consensus around them, his efforts to change policies, laws and the course of history will largely be in vain. In enlisting others in government that serve with him to support his initiatives, he knows that their willingness to do so is based on the pressure they feel from their constituents to align themselves with the statesman’s vision. Thus, success ultimately hinges on his ability to convince his country’s citizens of the soundness of his philosophy. To win their hearts, the statesman shuns media campaigns and instead harnesses the power of the written, and especially the spoken, word; he is a master orator. His lifelong study of great books and the lessons of history allow him to speak to the people with intelligent, potent, well-reasoned arguments. Instead of tailoring his rhetoric to the public mood, he speaks to the very best that exists within people, understanding that powerful rhetoric can articulate, bring forth and activate sometimes deeply buried ideals. His authority derives from his belief in what he says. He does not make emotions soar and burn with empty promises, but instead keeps his word and does what he says he will do. 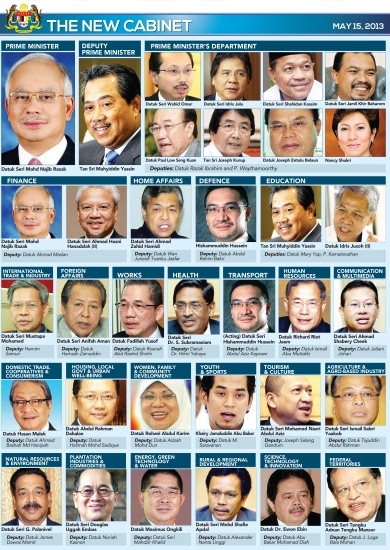 Let's look at our PM's new cabinet, and evaluate these ministers above using Prof Fears' criteria. By the way, include the PM as well in the evaluation. If you have the time and interest, go to Amirul Ruslan's blog. He has taken the trouble to post links to wikipedia for background information on each of the ministers and deputy ministers. Don't be surprised to find nothing much mentioned about most of them. Yet we are supposed to accept them and trust them to lead the country of 29 million people. 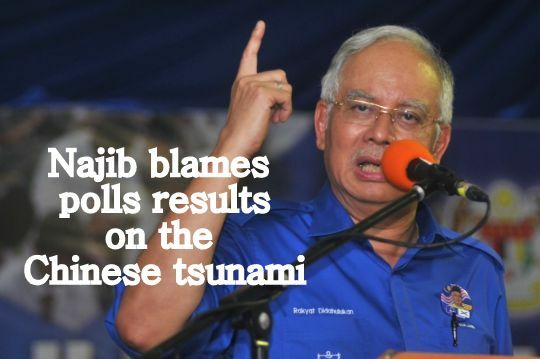 And if the first public statements made by the PM and by the new Home Minister are anything to go by, the future doesn't augur well for the people of Malaysia, especially for those who did not vote for the ruling political party in the recent general elections. Unbecoming of a PM to make such a remark. The people have a right to choose who they want. He has no right to tell those who didn't vote for the ruling party to 'leave the country'. The country doesn't belong to him. Not a positive start for the new cabinet in winning over the people's confidence. And going by Prof Fears' criteria, how many cabinet ministers do you think made the cut? Start the countdown from 5. 4? 3? 2? 1? O? Anyone who views this video below and remains unaffected by it must have a heart of stone. I think we are all guilty in one way or another of contributing to the unrelenting, merciless pollution and destruction of this beloved home planet of ours. One-third of the young birds on Midway Island die from eating plastic items which they thought was food. Imagine if these birds were human babies. 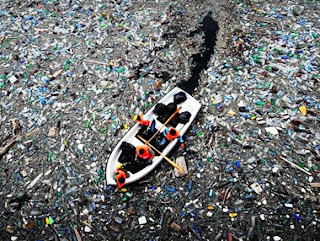 Perhaps that is the only way we can truly understand the magnitude of the devastation we have wreaked on the environment and the countless millions of animals and birds we may have knowingly or unknowingly, directly or indirectly killed. 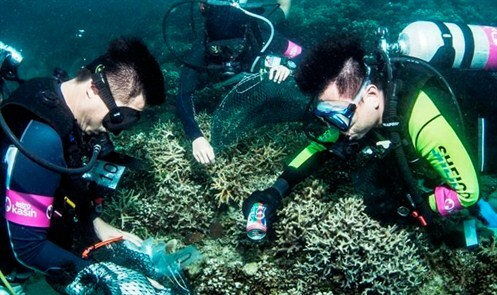 ASTRO Kasih volunteers must be commended on their recent efforts to clear underwater trash at at 14 dive sites surrounding the Tunku Abdul Rahman Park here from April 6-13. Altogether 134 divers from Malaysia as well as France, Australia, New Zealand, United Kingdom, USA, Lithuania, Switzerland, Hong Kong and the Netherlands collected over three tons of marine debris, including plastic bottles and bags, fishing lines, nets, cans and tires. 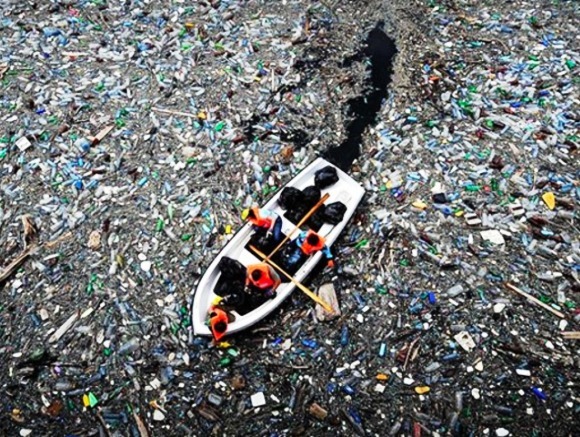 Surely the least we can do is help by reducing our use of plastic and keeping our beaches clean. My two gorgeous daughters - so proud of how they have turned out. 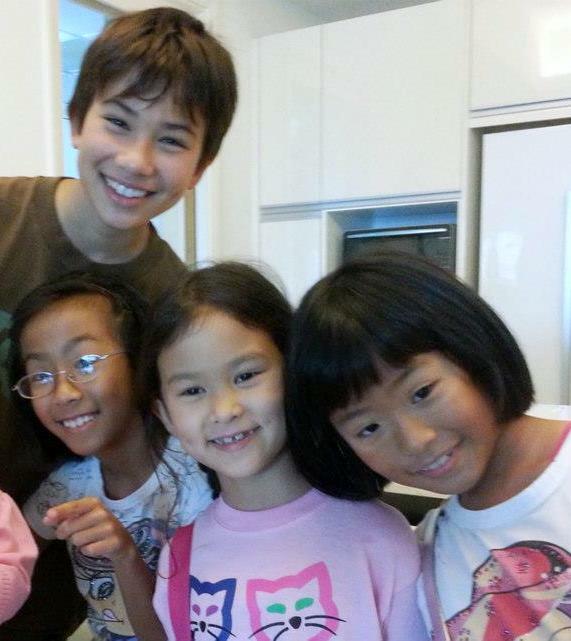 To my four grandchildren, may you grow up with all the right values your mother has instilled in you. 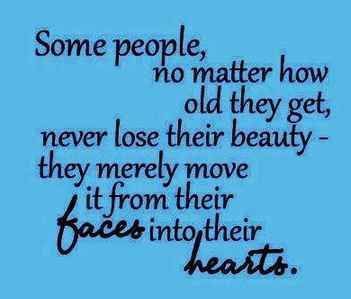 This video below is specially for my two daughters who are remarkable mothers in their own right. Two different and opposing ways of raising their children, but nonetheless, my grandchildren have grown up to be loving and caring - just like their moms! Oh, and smart too! And to my dearest mother who raised six children on her own when she was widowed at the age of 29, I owe you a lifetime of gratitude for all your sacrifices in bringing me up. And for all mothers everywhere, a prayer for you on this special day. The Straits Times (ST) is a Singapore English daily, the New Straits Times (NST) is a Malaysian English daily It is easy to confuse the two.. This morning I had an interesting chat with a group of Singapore friends. They had many questions to ask about the results of Malaysia's 13th General Elections held last Sunday 5 May. Were all the allegations of elections fraud true? Is the situation tense in Malaysia? 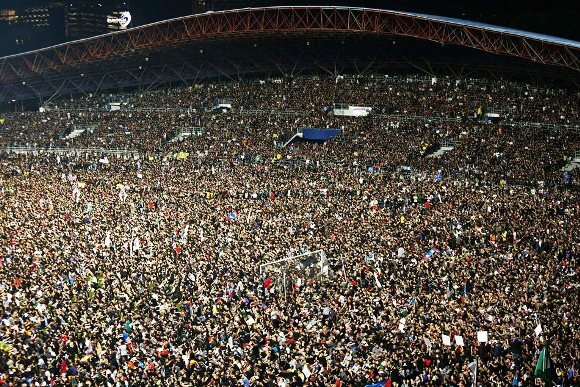 Are the people happy with BN's win? Will Najib be the new PM for the next five years? What do the results mean for the country's future? I was told that Singaporeans had been following the elections keenly. 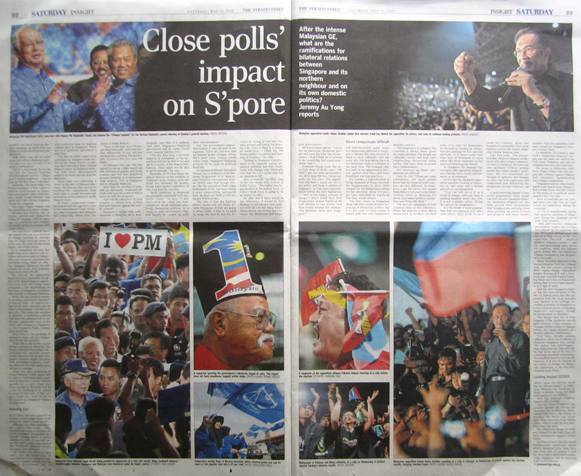 The Straits Times had dispatched a team of 15 correspondents and photographers to several key towns to provide up-to-the-minute reports and analyses of GE13. 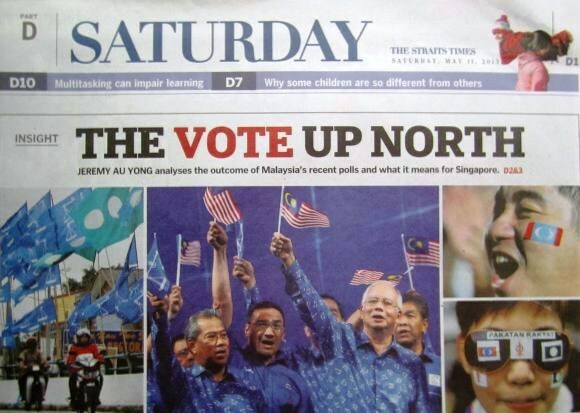 RARELY has there been an election campaign up north that has drawn so much attention from Singaporeans. Both online and off, in coffee shops and offices, Malaysia's general election has proved to be quite a talking point. Part of it was simply due to the fact that the Barisan Nasional (BN) stronghold of Johor - Singapore's closest neighbour - was in play for the first time in decades. Suddenly, the Malaysians who live in Singapore or who commute here for work became an important constituency. Johor chief minister Abdul Ghani Othman even spent half a day visiting Singapore during the campaign. The other, bigger reason, was the possibility of a regime change. This shouldn't come as a surprise as Singapore and Malaysia share a common history. 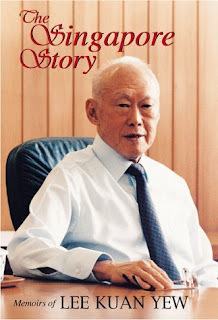 Many Singaporeans have family members in Malaysia, many of the republic's corporate leaders were born in Malaysia, and thousands of Malaysians study and work in Singapore. 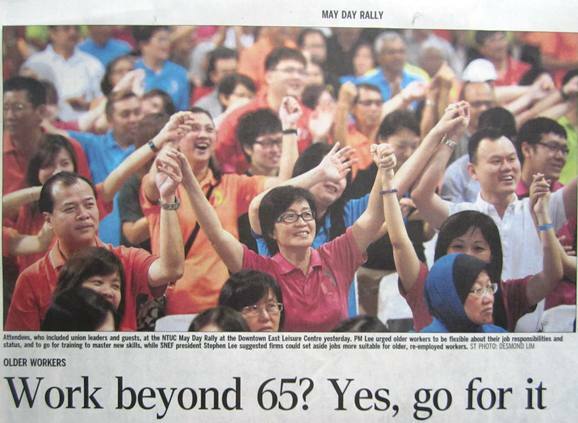 So how have Singaporeans reacted to the news that BN has won? Going by the reports in the ST, the BN's win was generally welcomed as it meant Singapore-Malaysia ties would continue unaffected, and there would be no disruptions in business deals especially for Singapore companies that have invested heavily in the Iskandar region in Johor. I am sure the Singapore PAP government is also relieved as the results send a subtle message to the people that it is not that easy for the opposition to topple the ruling party. My Singapore friends praised the courage of Malaysians for uniting and standing up against what they see as injustice and corruption. I had to agree with them. 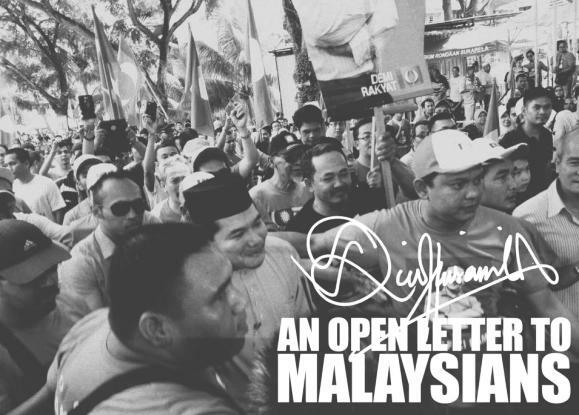 Malaysians are no longer afraid to speak out against what they see as injustice and corruption. Riot police, tear gas and water cannons no longer stop them. The threat of arrest no longer cows them into silence. They say there is strength in numbers. This is so true in the Malaysian context. That is where the courage springs from - the knowledge that there are hundreds of thousands who share the same aspirations and want the same things for themselves and their children. That they are not alone. That is what has galvanized the people to come together as one united front to press for justice. Power will always belong to the people. History has repeatedly shown this to be so. 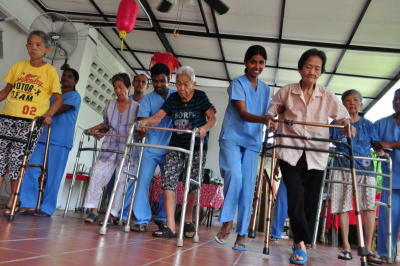 as 'an old folks' home. A TUSSLE by a couple in their 80s over who owned a $20 million bungalow in Chancery Lane has been settled in favour of the husband by the High Court. Justice Choo Han Teck found retired businessman See Fong Mun, 86, had paid for the house that was bought in 1983 but registered in the name of his wife Chan Yuen Lan, 88. At the heart of the issue was whether the property belonged to the person who paid for it or the person in whose name it was registered. The case helps make clear that a registered legal owner of a property paid for by another can be treated as a trustee of the property for the payer, who is the real owner of the benefit from the property. To arrive at the decision, the court will look at all the circumstances, including the intention of the parties at the time of purchase and from whom the monies came, and decide if it was being held either in a resulting or constructive trust. 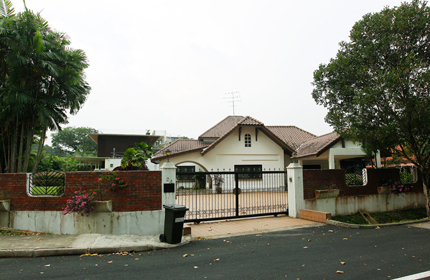 In the case of the Chancery Lane bungalow, Justice Choo found that it was held in a resulting trust because from the start, the couple had both intended for the property to belong to Mr See. Three days before the purchase was made in 1983, Madam Chan signed a power of attorney authorising her husband and their eldest child Cliff to take charge and manage the house. But in April 2011, she revoked the 1983 power of attorney, a move that prompted her husband to seek a High Court order to nullify her action. In his written judgment released yesterday, Justice Choo noted wryly in the opening sentence: "This is a case about an old folks' home - a very large and expensive house." The double-storey house sits on a plot of land just over 20,000 sq ft, and is a good class bungalow in an upscale neighbourhood. 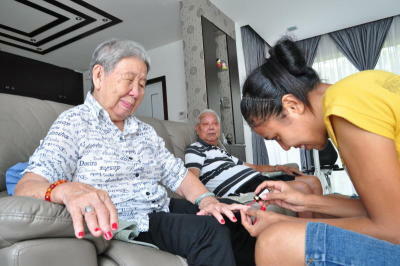 The couple married in 1957 and Madam Chan stopped working as a hairdresser after marriage. They have three children, aged 55, 53 and 51. The now-retired Mr See was the sole breadwinner except for one year, and Madam Chan depended on the household income he gave her, the judge noted. Mr See was a self-made millionaire who started two companies. In 1983, when he turned 55, he bought the bungalow with money put together from various sources, such as his Central Provident Fund savings and a $290,000 loan from Madam Chan. Justice Choo found the loan was repaid and could not be considered as her share of the purchase of the house. Madam Chan, defended by lawyer Simon Jones, had also argued, among other things, that Mr See had bought the house as a gift as he felt "guilt-ridden" by an extramarital affair with his secretary. But the judge found the overall evidence to be very weak and was not convinced that Mr See bought the bungalow "out of sheer conscience or moral responsibility". "A man nearing retirement age who had just fallen in love with another woman was unlikely in the circumstances to scrape together a $1.8 million fund from multiple sources to buy a house... as a gift to his wife," he noted. 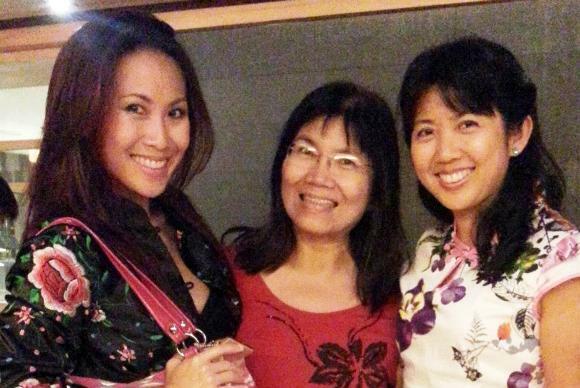 Mr See, represented by lawyers Lim Seng Siew and Lai Swee Fung, claimed his wife had asked for the property to be put in her name "as the husbands of all her friends had done so and she wished to flaunt it to her friends". Mr See agreed in exchange for her written agreement confirming that he was the sole and ultimate owner. The veracity of his claim was disputed by two sons, who were on opposing sides. "As neither account was inherently unbelievable, my finding could only be based largely on credibility," said Justice Choo, who found the older son Cliff to be a "more measured and candid witness". He also noted that Mr See's affair did not lead him to divorce his wife, and the house has remained their matrimonial home. 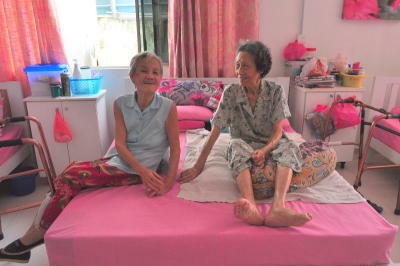 Madam Chan had lived in it since 1983 until the lawsuit started last year, when she moved out, but not at his behest. ARE SENIORS TRULY THE HAPPIEST DEMOGRAPHIC AS SURVEYS SEEM TO SHOW? The new 'old' do not fit the negative stereotype image of seniors who are frail, senile and decrepit. Definitely time for new labels for the new 'old'. 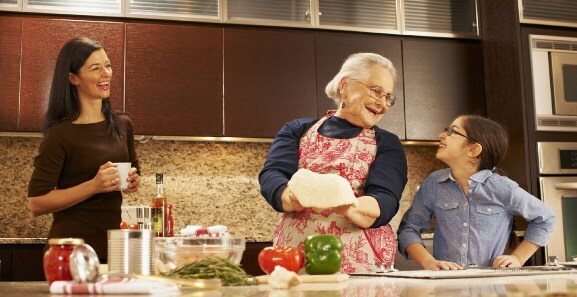 Seniors are the happiest demographic in Canada, according to a survey released Monday, with people 66 and older outshining all other age groups in terms of overall contentedness, optimism about aging, the sense that “age is just a number,” and the belief that you should never stop living life to the fullest. 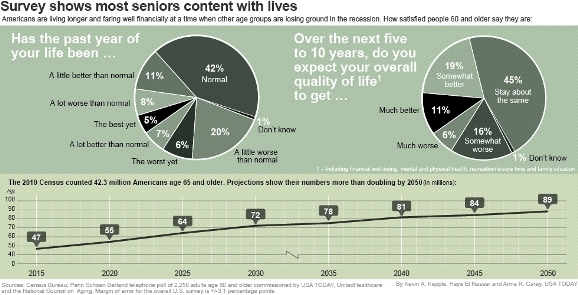 Like Canadians, seniors in the United States are generally happy with their lives as the survey below shows. Read the full article in US Today. What about here in Singapore? Are seniors here happy? If this government report is anything to go by, the answer is Yes! The government continues to promote programs that ensure future generations of older Singaporeans enjoy an active, healthy and productive lifestyle as they age. That makes for happy seniors anywhere in the world. 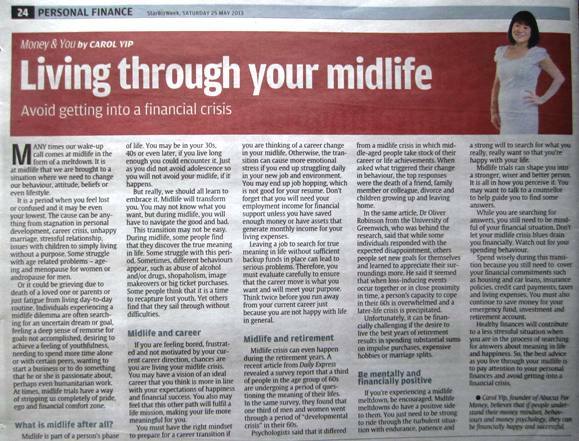 There was a time not too long ago when workers looked forward to their retirement at the age of 55, before the official retirement age in Malaysia was raised to 58, and then to the current 60. I recall many of my former colleagues in the teaching profession opting for early retirement at 40! For the private sector in Malaysia, the retirement age has remained at 55. 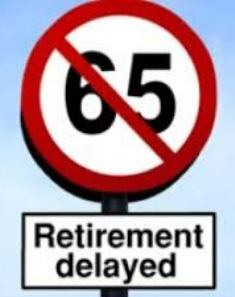 This is set to change when the Minimum Retirement Act 2012 comes into effect on 1 July 2013. 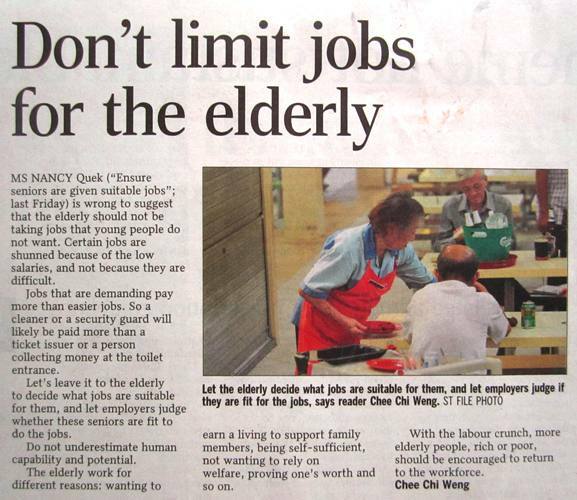 In Singapore, under the Retirement and Re-employment Act which was implemented in 2012, employers must offer re-employment to workers turning 62, at least up to 65. Whatever the retirement age, there will always be mixed views from the stakeholders. The government can't please all parties concerned, and compromises have to be made. Employers see the new minimum retirement age in terms of higher costs in payroll and healthcare provisions. Fresh job seekers see fewer opportunities open to them while ambitious young professionals see a longer wait for career promotions. 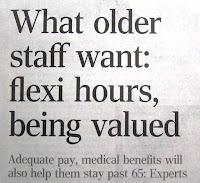 What about older workers? 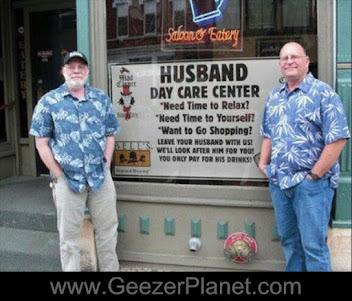 Their views about retirement have certainly changed. While there are still many who can't wait to clock out for the last time at their place of work, a growing number want to continue working as long as possible. And it's not just to keep themselves physically and mentally busy. More importantly, they need the financial security that a steady job offers. As it is, many are struggling to cope with the rise in the cost of living. Whatever retirement savings they may have accumulated over the years are insufficient to see them through the next 20 or more years. The longer life expectancy of 76 is both a boon and a bane. There are housing mortgages and insurance premiums to pay, car loans and credit card debts to settle. 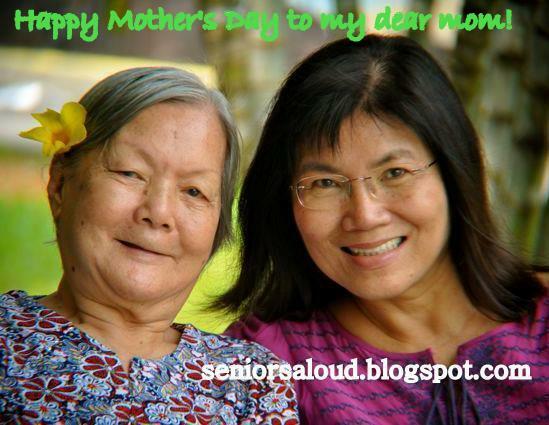 Many still have to support their elderly parents and finance their children's further education. 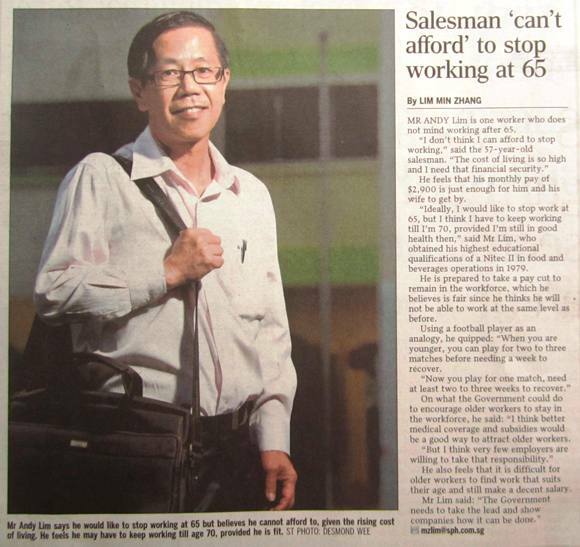 Mr Lim is representative of baby boomers who have to work for as long as possible to make ends meet. Older workers simply can't afford to retire at 55, 60 or 65. For young people who oppose raising the retirement age, be thankful that your working parents are self-supporting, and not a financial burden to you. 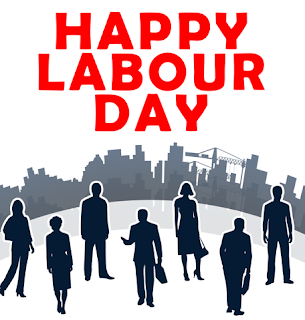 In conjunction with Labour Day today, I would like to single out for special mention two companies, one in Singapore, the other in Malaysia. Both have a soft spot for older workers when it comes to hiring staff. 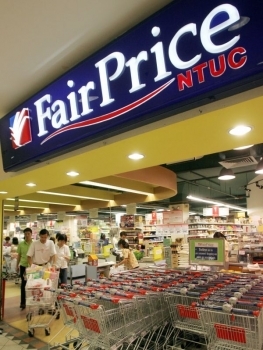 Unlike many companies that pay lip service to the Tripartite Alliance for Fair Employment Practices, Singapore's FairPrice supermarket chain wants to be known as an age-friendly company when hiring workers. Indeed, CEO Seah Kian Peng, 51, is proud to say that more than 40% of the supermarket's workforce is aged 50 years and above. The oldest employee is 71. That's not all. 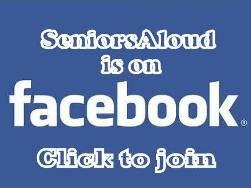 Every Tuesday is Senior Citizens' Day. Any customer who is 60 and above gets a discount on their purchases. You don't need to apply for a discount card as long as you look 60 or older. FairPrice takes its corporate social responsibilities seriously. 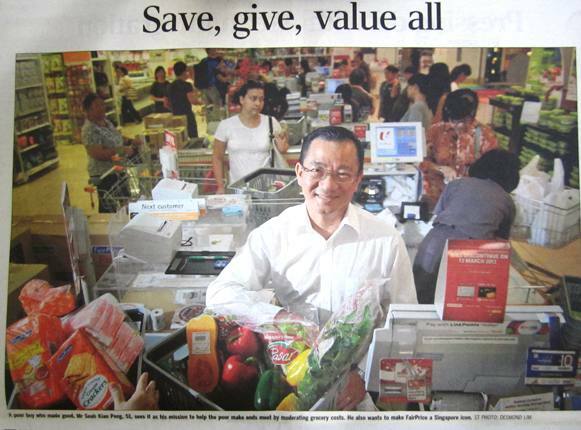 In 2008, it expanded its CSR programme with the establishment of the FairPrice Foundation, a registered charity, bringing the supermarket one step further towards achieving its vision to be "a world-class retailer with a heart". Lam Soon Edible Oils, a public-listed company in Malaysia did the country proud by winning the 2011 AARP International Best Employers for Workers Over 50 Award. 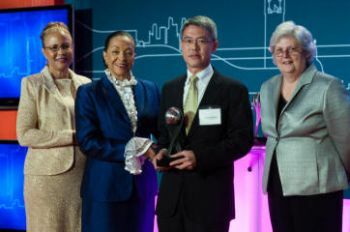 This award recognises top 15 non-US companies that have demonstrated outstanding workplace policies and best HR practices for their mature employees. Says Lam Soon executive chairman Whang Shang Ying, “We have a total number of 1,456 employees and 20.1% of them are over 50 years of age. We believe that the older employees possess great experience and are able to contribute significantly to the company. 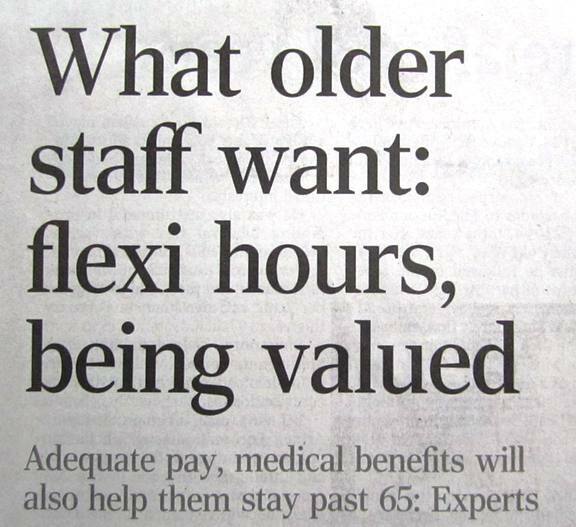 Older workers certainly have much to contribute in terms of knowledge, experience and skills. Companies like FairPrice and Lam Soon know the value of having a pool of human resources that cut across demographic divides. Age diversity in staff employment can only enrich the working culture and ultimately the ROI of a company. If more companies changed their negative mindset about hiring older workers, those aged 50 and above would have reason to celebrate Labour Day.